There are numerous ways to look at the toughest schedules for 2018. In my magazine I always my final numbers for who played the toughest regular season schedule. In the toughest schedule article every year I list what type of regular season schedule the team played the prior year and then what type of schedule that same team faces this year. This is on pages 26 and 27 in the magazine. The “Going Up” Box highlights the teams that play a much weaker regular season schedule than they did the previous year. The premise is that with an easier schedule a team has a great shot at improving their record. Last year the “Going Up” Box featured 14 teams and 11 of them managed to improve their records. Even more impressive is that the Top Ten teams in the box, ALL managed to improve their records, a perfect 10 for 10. The most impressive team of the group was Florida which went from 4-7 to finishing No. 7 in the country at 10-3. Two other teams of note were Syracuse and Georgia Southern which went from 2 and 4 wins respectively to double digit wins with Syracuse ending up No. 15 and Georgia Southern No. 36 in the final AP poll. The “Going Down” Box highlights the teams that play a much tougher schedule than they did the previous season. Last year there were also 14 teams in this box and once again 11 of those teams had a weaker record than they did in 2017. The team that made the biggest drop was Florida Atlantic which went from 11-3 in 2017 to just 5-7 in 2018 despite entering the season No. 30 in the AP Poll. I will delve into these further in tomorrow’s blog when I provide the final ranking for 2018’s regular season schedules. This ranking today is for toughest foes and I use it when comparing the results and stats from last year from team to team. The team that has the biggest difference in the two charts is the Alabama Crimson Tide. The Tides regular season schedule was very manageable this past year and they cruised thru the schedule with many blowout wins and Tua rarely even playing in the fourth quarter. I do not have the final ranking yet but I had projected their schedule as the 48th toughest in the country coming in and that is the area they finished in. Once the season was complete Alabama took on Georgia in the SEC Title game, Oklahoma in the first round of the playoff and then Clemson in the title game. That made their schedule jump up to the 2nd toughest in the country as they ended up facing 10 bowl teams and five that finished the season ranked. They only faced six foes during the regular season that finished with a winning record and that number jumped 150% to nine and they went from facing just one top ten team up to four that finished in the top 8! The NCAA method for toughest schedule relies on win/loss records of opponents but as I point out in the article on pages 27-28 that is not the best method. There were seven Group of Five teams that finished with either 11 or 12 wins. Texas, Florida and Michigan all had just 10 wins last year and would have been favored over all those Group of Five teams and in some instances by significant margins. My toughest foe rankings take into account many different factors. I have nine sets of power ratings and I plug those into the schedule and get a consensus strength of schedule based on my final power ratings for each team. While I include the win/loss percentage of opponents faced I take out the record of the team. Notre Dame and Alabama won all their games during the regular season and their foes picked up 12 of their losses because they lost to them. I only count the opponents records in all other game taking out the teams’ records. Five teams went 1-11 but their opponents only won 11 of those games because they were playing those weak foes. 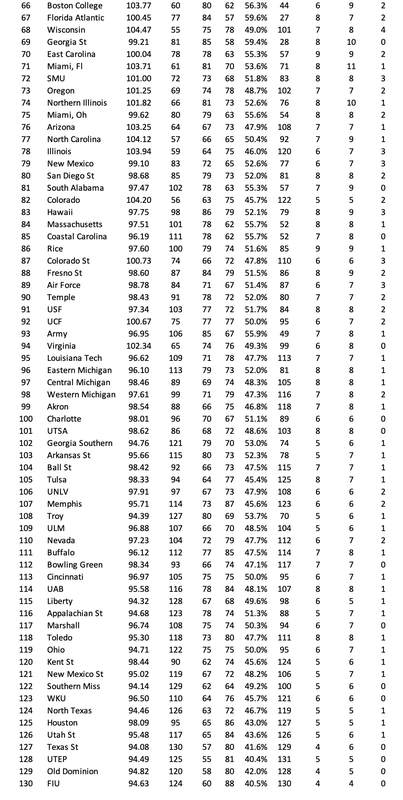 I also took into account the number of ranked teams each team faced during the entire season including the bowl. Two other factors were the number of teams with a winning record and number of bowl teams faced. The Power Five team that played the weakest schedule was Virginia and that even counts their bowl win over South Carolina! They did not face a single team that finished the season ranked all year. Texas A&M drew both Clemson and Alabama during the regular season while playing in the rugged SEC West and drawing two bowl teams out of the East. They faced the toughest schedule AFTER the postseason is factored in. Pitt faced 12 bowl teams in 2018 and five of them ended up ranked. I use these rankings to compare how teams should be looked at. If a RB, rushes for 1,000 yards against a No. 120 schedule that has to be factored in when comparing that back to a similar one that rushed for 1,000 yards against a top 10 schedule. It also comes in handy when comparing teams. If two teams both averaged 31 points per game, clearly the team that faced the much tougher schedule had the more potent attack. Here are my final rankings for this year.